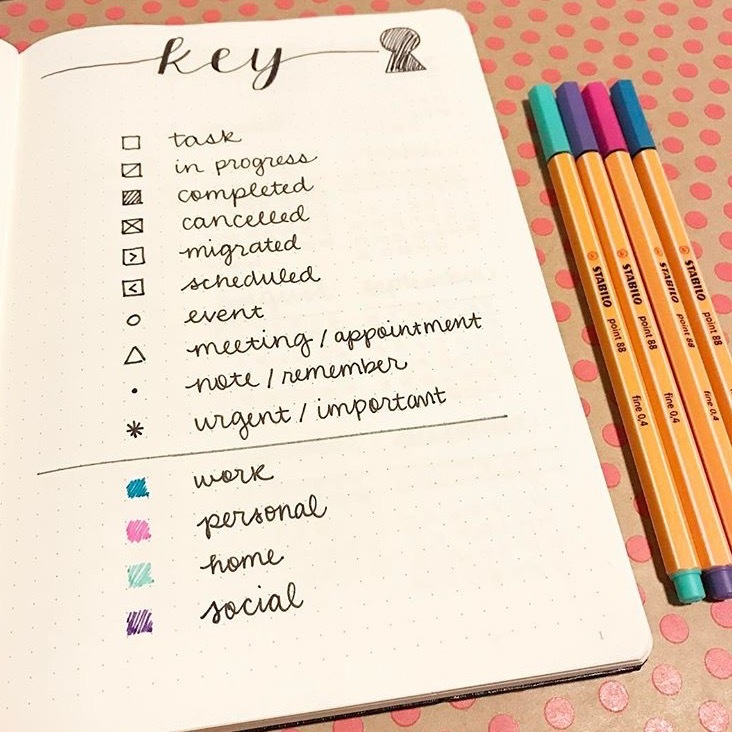 A bullet journal is an analogue planning system created by Ryder Carroll, a digital product designer based in New York. 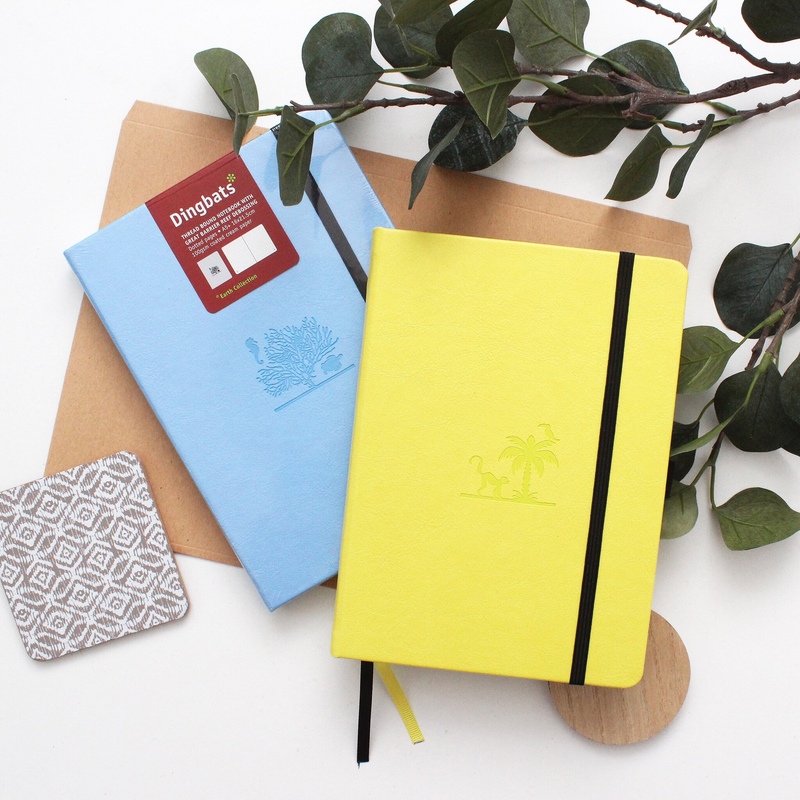 It is an ingenious mix between a planner, a diary and all lists possible and imaginable. 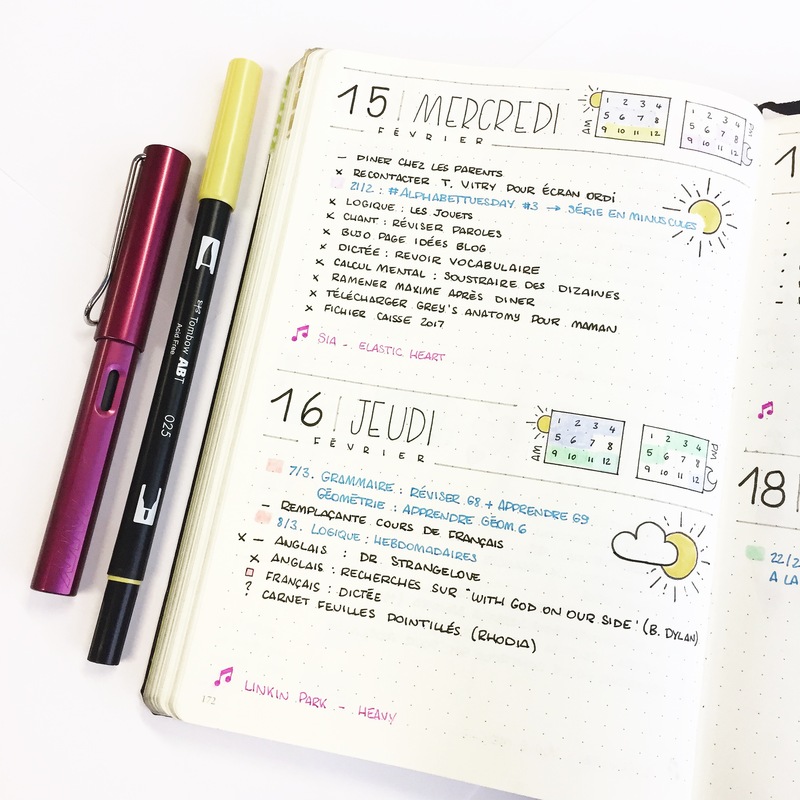 To start a bullet journal, you need a notebook and a pen. That’s all! A bullet is an asterisk, black dot, circle or other mark that is found before a list item. 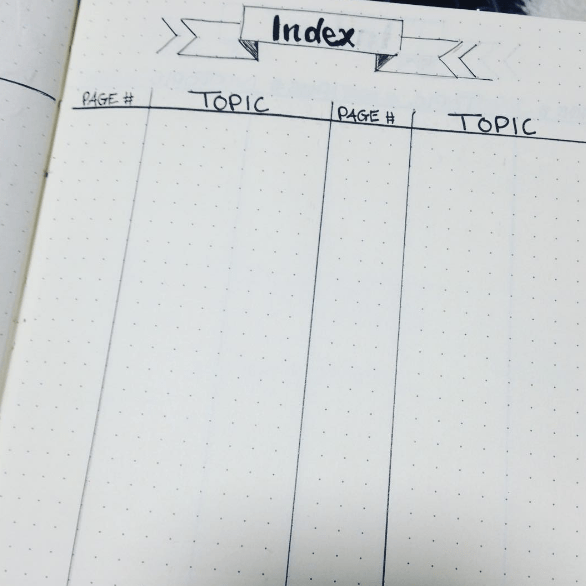 For easy reference, you will use the very first pages of your notebook as your index and table of contents : a simple table with two columns (page number in one, content of the page in the other). 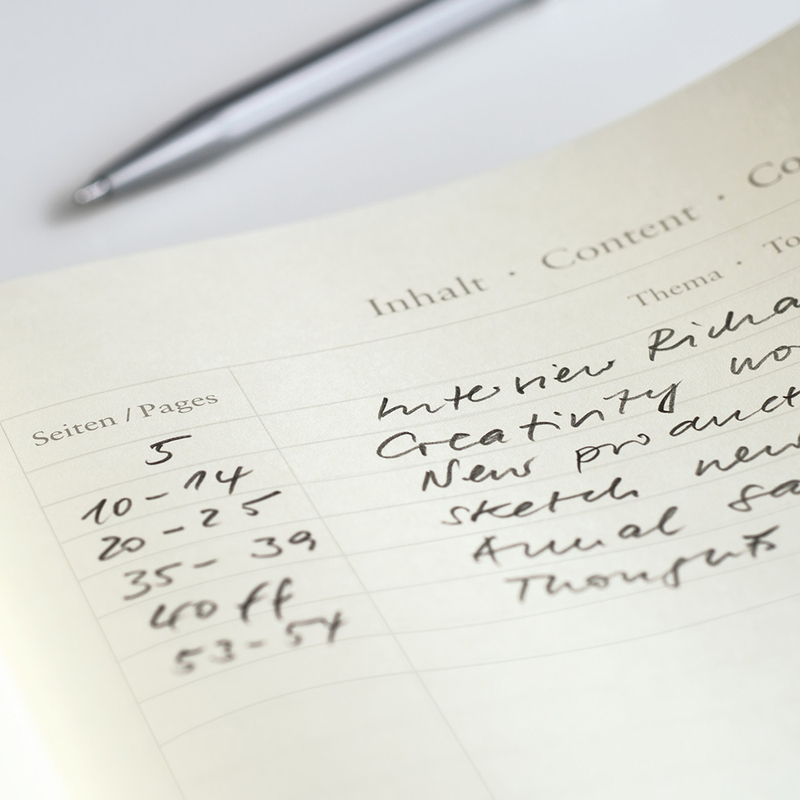 Your first task will be to create your index and to number your pages. 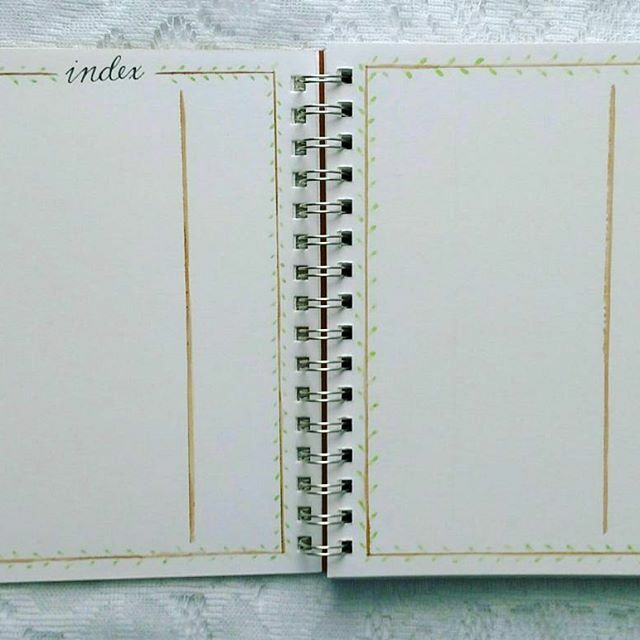 Tip : some notebooks already have an index and numbered pages. The next page will be your “key”. 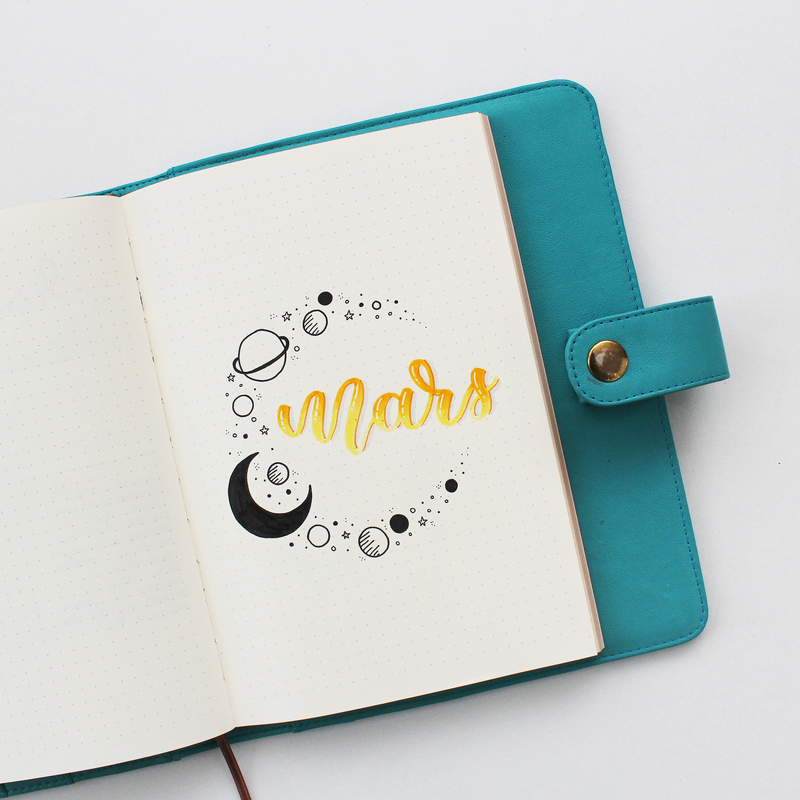 Write the symbols you want to use in your bullet journal. It can be the same code as Ryder Carroll or you can create your own! 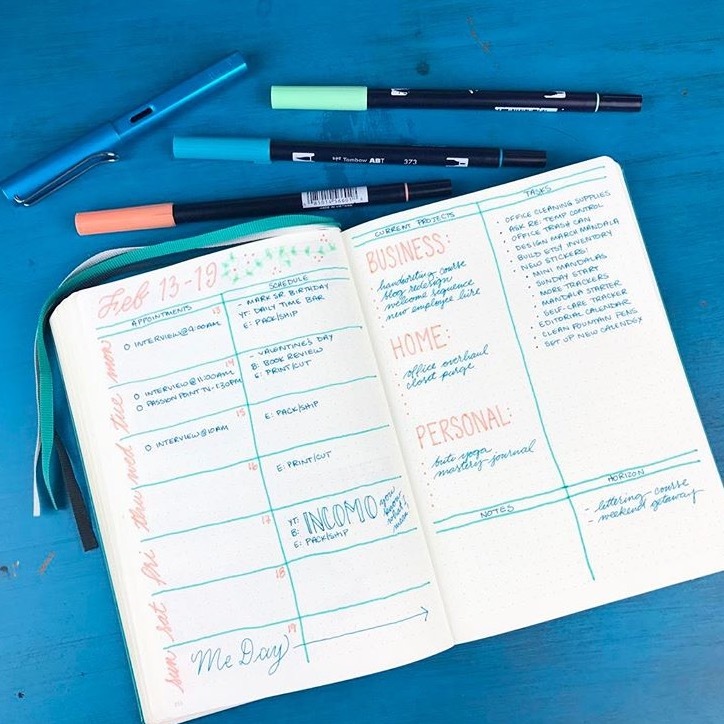 Tip : in addition to your bullet code, you can use color codes to organize different aspects of your life. You can add the meaning of these color code to the “Key” page. 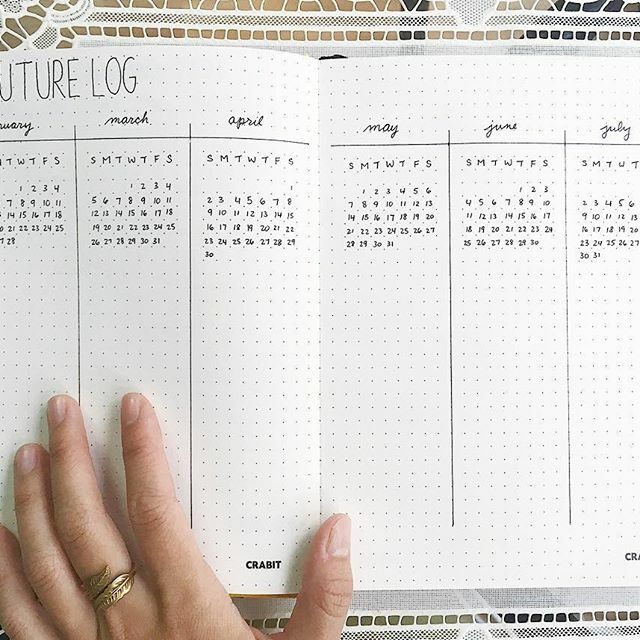 Turn the page to create your future log. You’ll be using it to log all the future events and tasks of your life. Most of the time, a future log is build over 6 months but if you think it’s too much or not enough, adapt it to you! 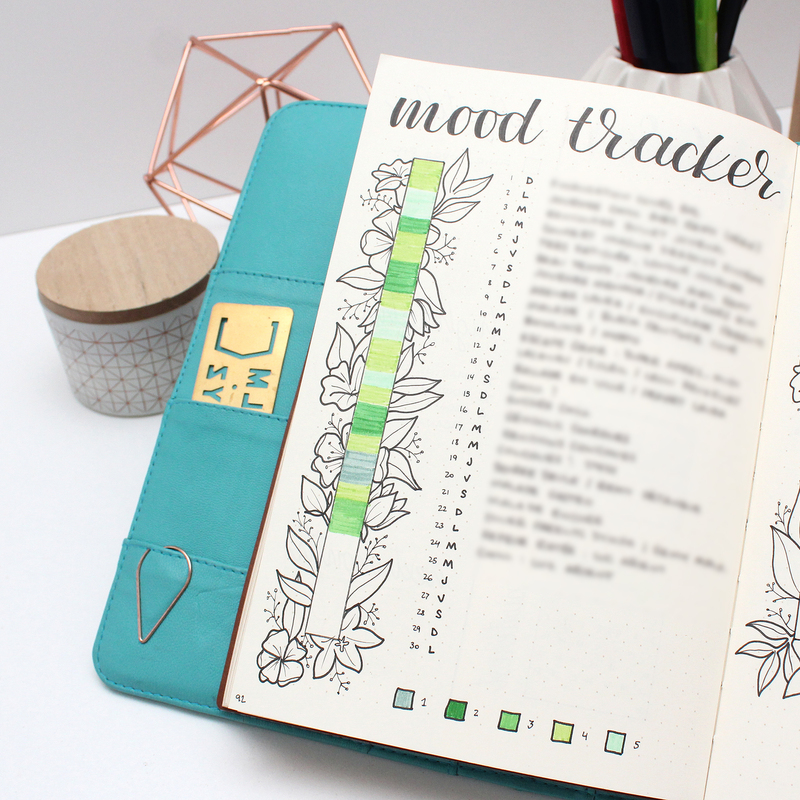 Next spread will be your monthly log. 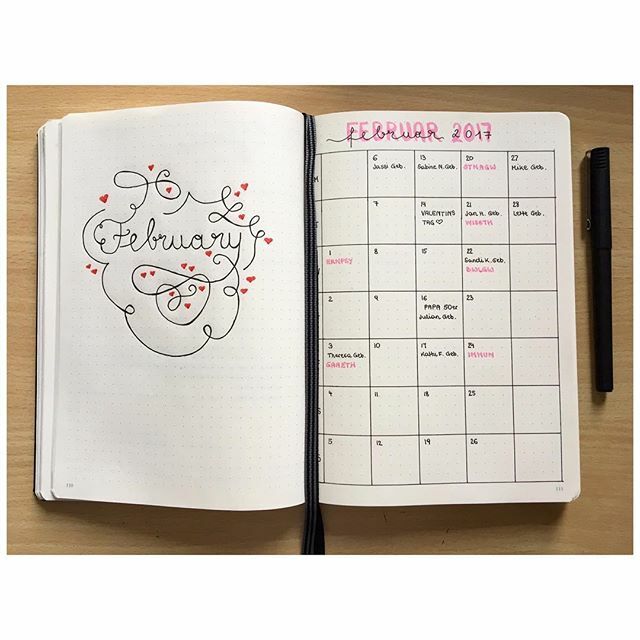 If you’re starting your bullet journal in March, your first monthly log will be March. 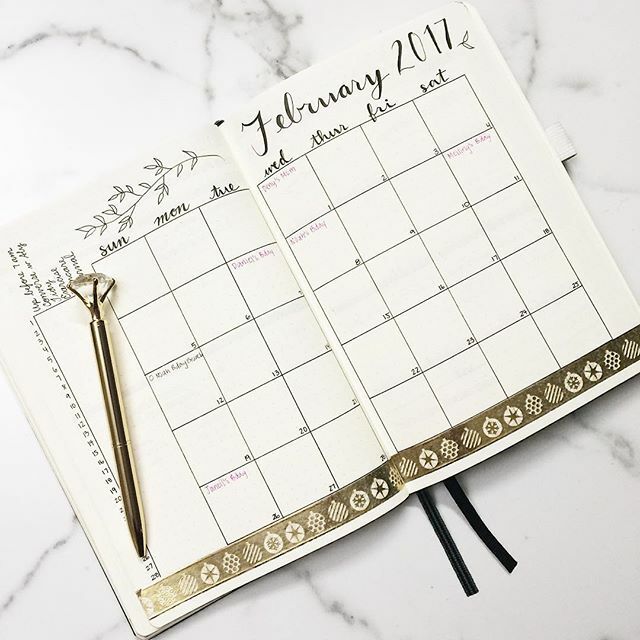 Use this page to record and/or schedule your tasks and events for the month. 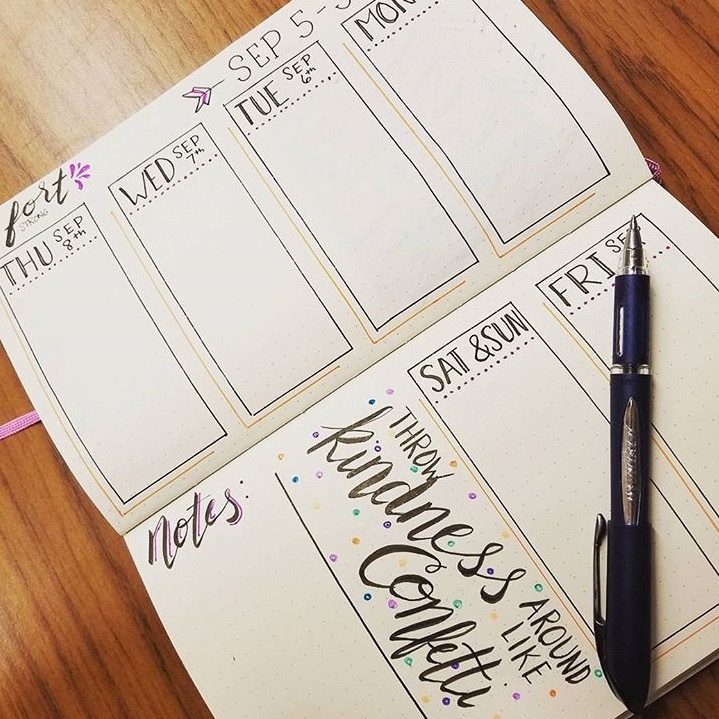 Important note : Weekly pages are not part of the Ryder Carroll’s basic concept yet many people use it because the daily log is unsuitable or insufficient for them. Some people need to have a weekly view of tasks. It’s up to you to find the layout that is right for you. 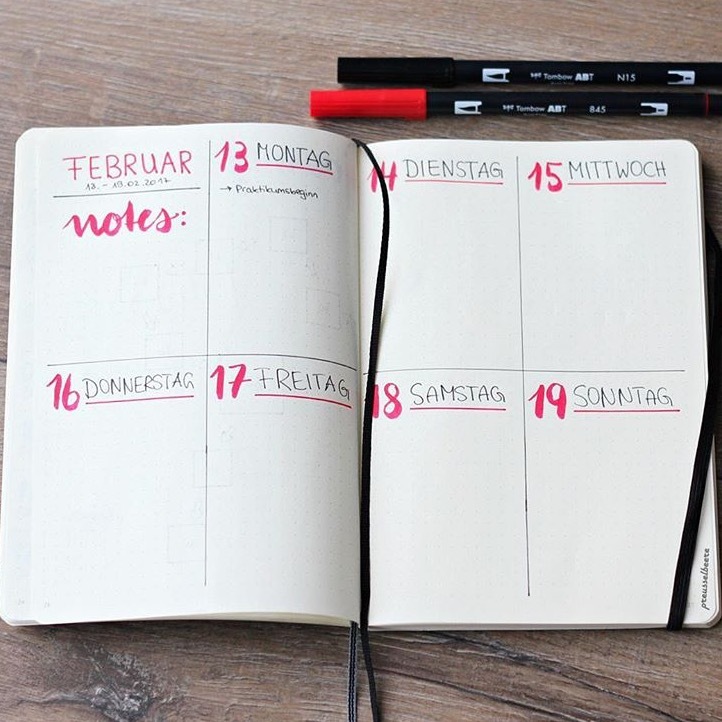 You can put your entire week on a double page, write 2 days per page, 3 days per page … adapt the method to your needs. 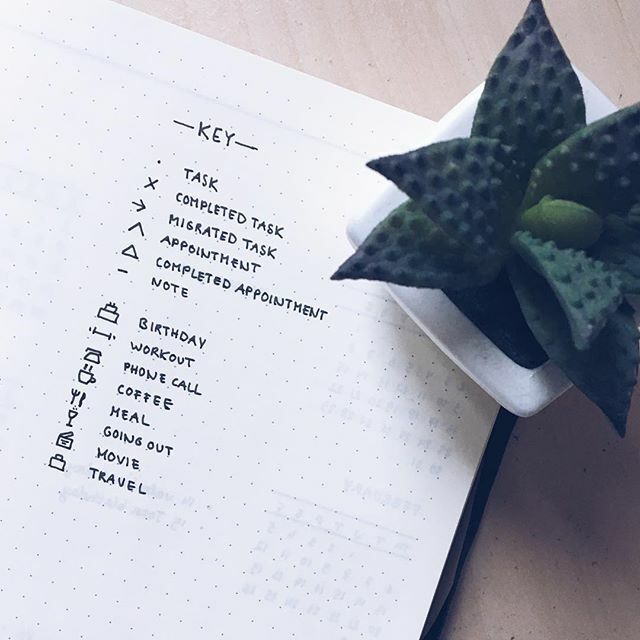 The daily log is used to organise your day. 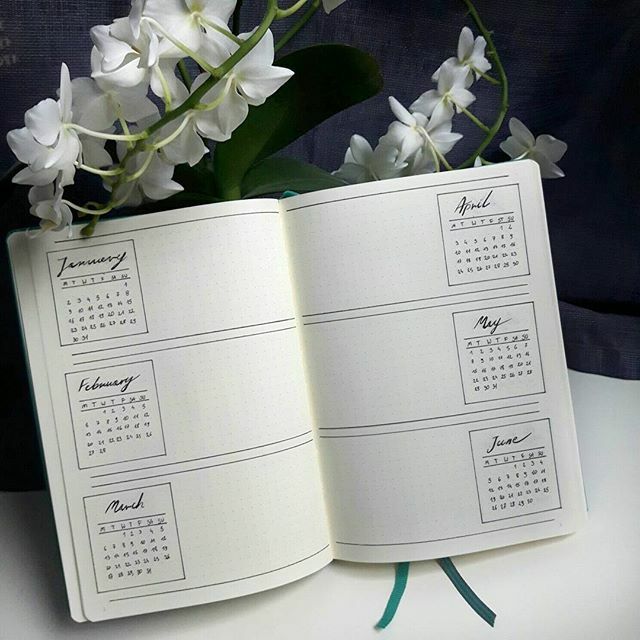 Write down the date of the day at the top of the page and write down your tasks, events, notes … as you go along. The next day, repeat the process. 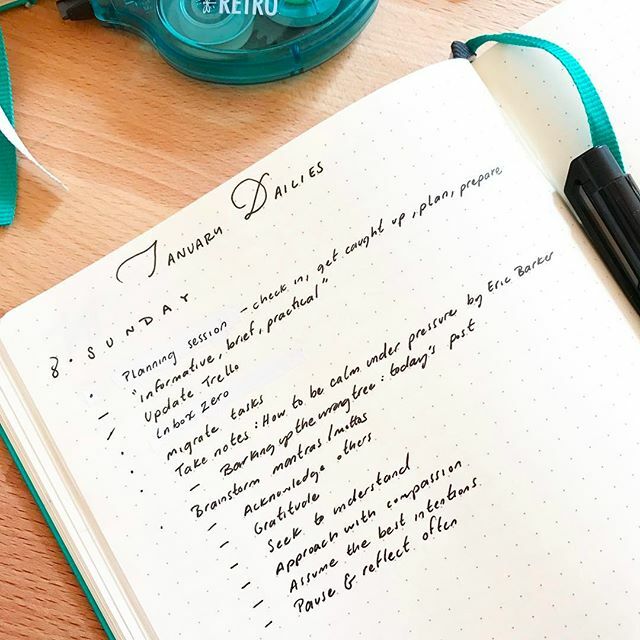 Migration is a cornerstone of bullet journaling. At the end of the day, the week, the month (again, adapt to your needs), check your tasks. Have they all been done? Good for you! Otherwise, analyze. A task no longer needs to be done? Cross it off. An uncompleted task that needs to be done? Migrate it. 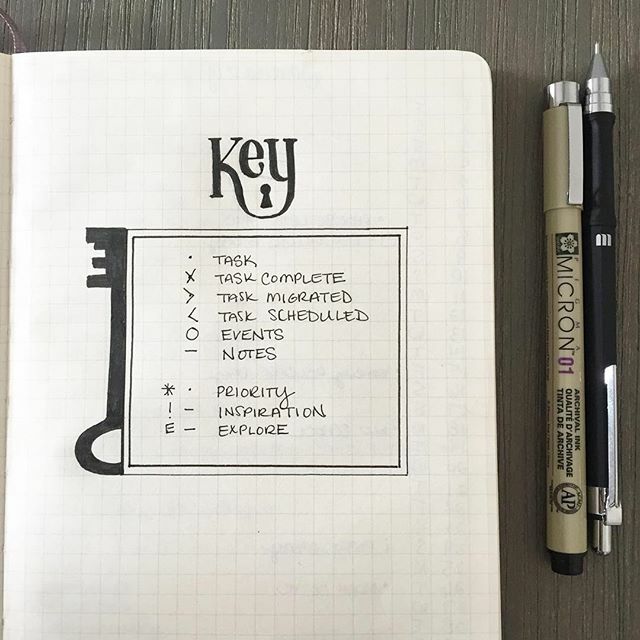 Transform the task point (•) into a small arrow (>), and then write down this task again wherever and whenever you need it to be done. You can also migrate scheduled tasks (<). Do you have an appointment with the dentist in April? Well, I feel sorry for you and your teeth. Write down this appointment in your Future Log. 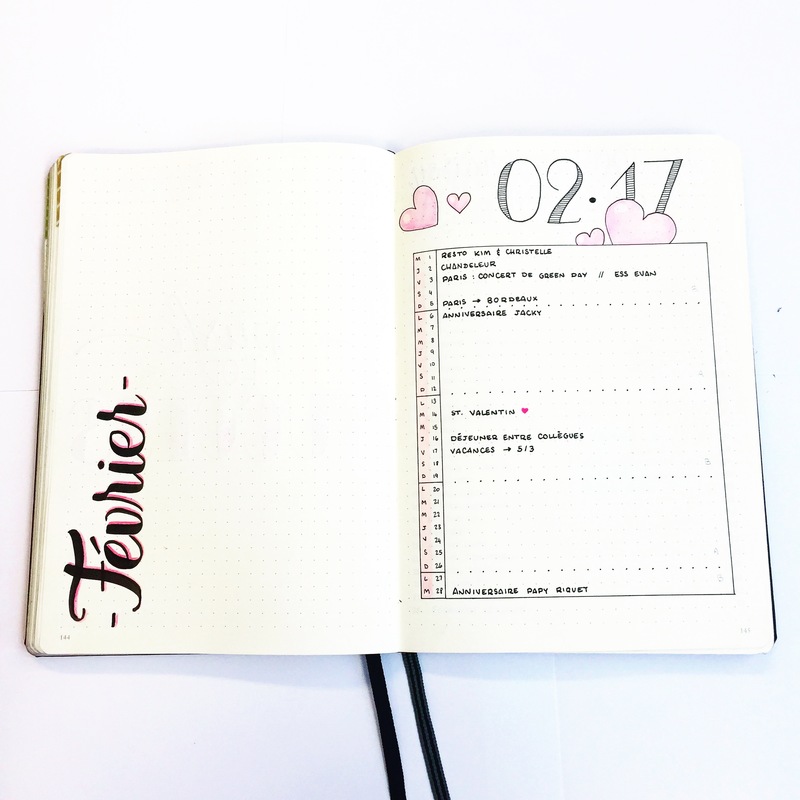 When preparing your bullet journal for April, check your Future Log and migrate the appointment at the dentist in your April Monthly Log. Rewriting the same task several times may seem annoying. Yet, it makes it possible to see what is really important. If copying a task seems useless, then perhaps the task is not so important. 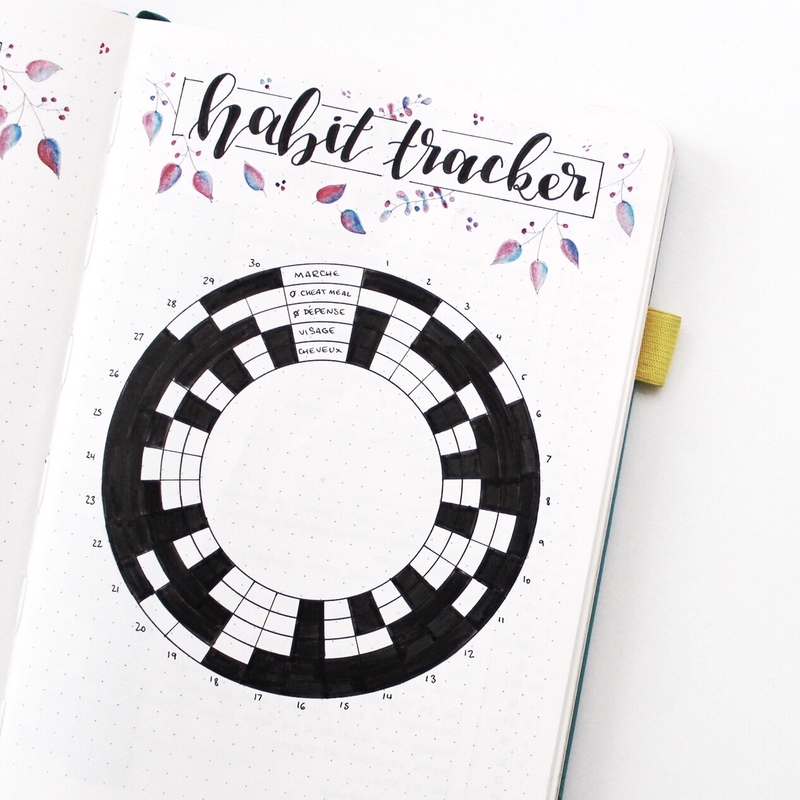 Use your monthly log to keep track of your recurring tasks. If you’ve got a guitar lesson every Tuesday nights, create a code for it (GL for example) and write this code in your monthly log every time you’ve got a lesson planned. 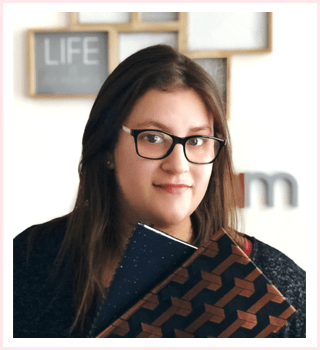 Collections are pages that are not directly related to planning. There are no standard collections. You can create them according to your desires and needs. Do you need a new collection? Go to the next blank page and do it! Don’t anticipate your pages. 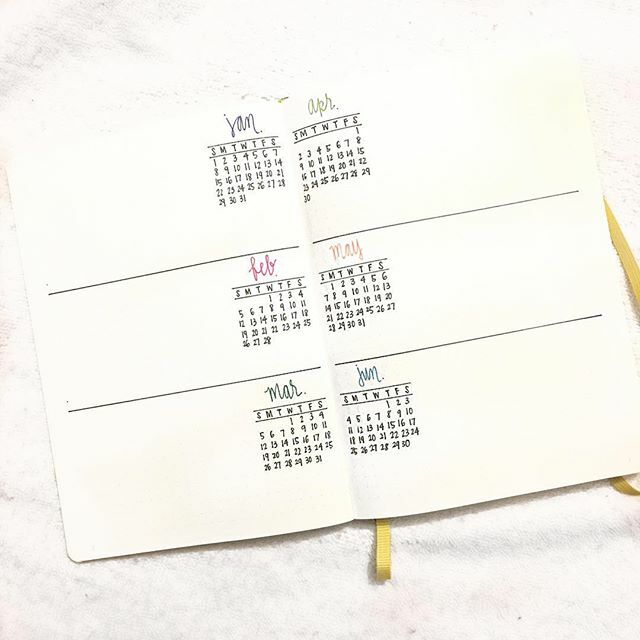 A bullet journal creates itself day by day. 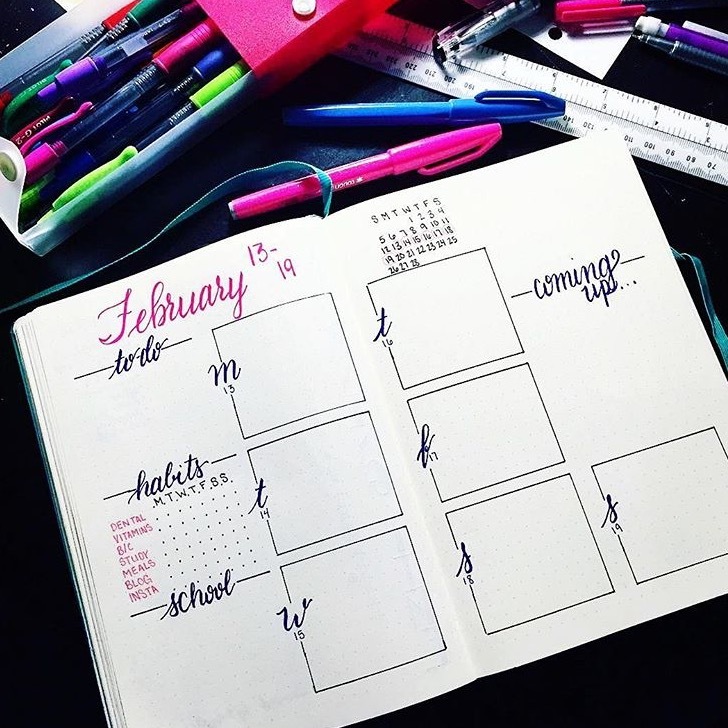 If you set your pages up months in advance, you’ll have a planner. 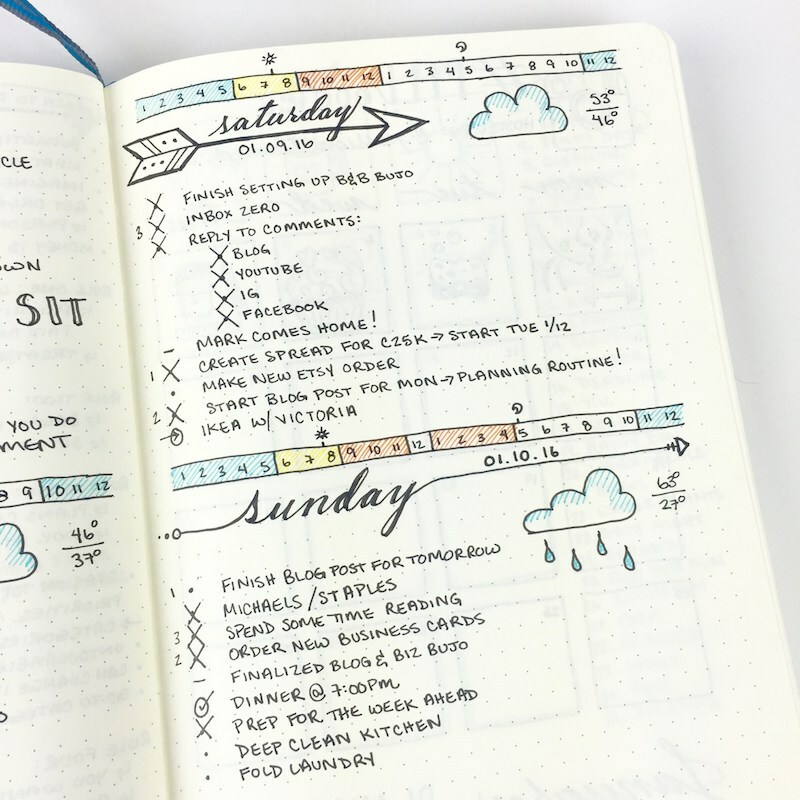 A bullet journal isn’t a planner. Start with the basics. Once you’re comfortable enough with the concept, adapt it to your needs. You’ll probably make mistakes and that’s ok! That’s part of the process. 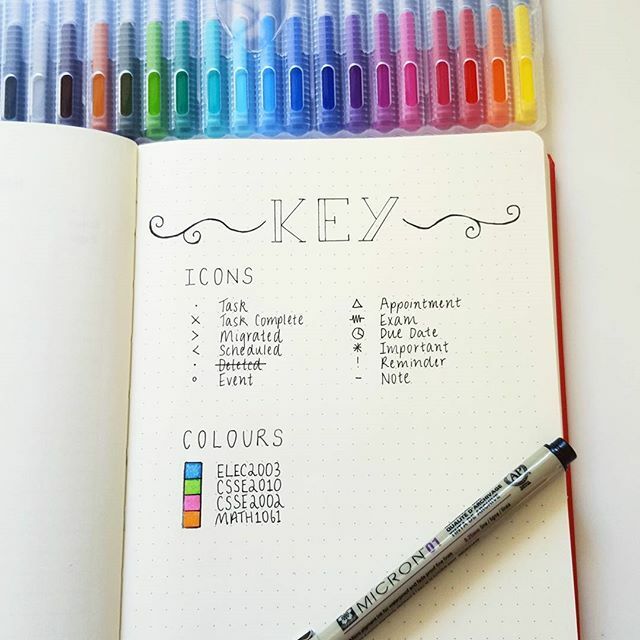 Bullet journal might seem complicated but once you get how it works, it’s so easy to use! It’s customizable and flexible. If you have any questions, queries, suggestions, feel free to share them with me in the comments or fill the contact form. Don’t forget to follow me on Instagram to see examples and find some inspiration.